The oldest continuously inhabited English settlement in the New World is where? 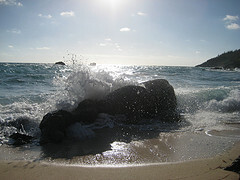 Answer: On this little island at St George. Settled in 1612 St George has a wonderful history, and recently we took the ferry over there to have a look. It was in 1609 that English settlers on their way to the new world hit what was probably a hurricane, and drove their ship, Sea Venture onto the reef, to avoid floundering and more than likely losing the 150 crew and their pet dog - there was a dog according to legend. The Admiral of the Company, Sir George Somers fought for three days against the hurricane, and his story was the inspiration for William Shakespeare's The Tempest. During the survivors time on the island they built two new ships from the wreckage of the Sea Venture and some local cedar wood and then continued their way onto Virginia. 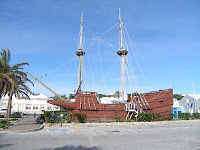 A model of one of the ships, The Deliverance can be found on Ordnance Island, reached by a small bridge from King's Square (photo below). Some of the crew and passengers remained on this deserted island but during their time they began to form the start of the Bermuda colony building a church and some houses. Admiral Sir George Somers named the town not after himself (as is often written) but in honour of the Patron Saint of England. 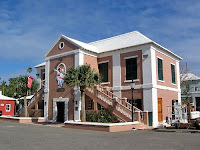 The flag of St. George is still flown only over St. Peter's Church, the oldest church on the island. One other interesting George Somers factoid: St George is twinned with the beautiful Dorset seaside town of Lyme Regis, Somers' birthplace and site of his buriel sadly just a year after he founded Bermuda in 1610. 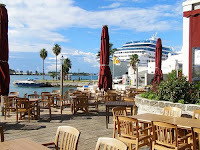 St George not only played a pivotal role in Bermuda's history (it was also the capital until 1815), but it helped shape that of the United States as well. 10,000 Bermudians emigrated, primarily to Virginia and the American Southeast and branches of wealthy Bermudian merchant families dominated trade in the area's ports. Throughout the 17th century St George was a very tied to Jamestown and contributed greatly to the developent of the US. During the American War of Independence, Bermudians stole much-needed gunpowder from an artillery magazine and then smuggled it out of Tobacco Bay (now a great beach just over the hill from St. George's) to George Washington. The people of St George's also probably prolonged the American Civil War by ferrying supplies and munitions to the desperate Confederates, a trade that was based in St. George's. St George hasn't probably changed much in almost 400 years. Many old stone buildings still stand today (built from models and drawings originally from England). They were built from Bermuda stone after 1619 for protection against elements and fires, which today still shiel d them exceptionally well from the Atlantic winds. The town has remained a port and home to Bermudian families handed down houses through the centuries, but St George has happily avoided the financial boom that has engulfed the now capital Hamilton. The town is very pleasing on eye with it's narrow lanes such as Barber's Alley, Turkey Hill and Aunt Peggy's Lane. At its centre lies King's Square complete with it's own Town Crier. Surrounding the square is the Town Hall and the Visitors Service Bureau. There are replica stocks in the Square, and also a ducking stool, used in colonial times as a punishment fitting such crimes as gossiping, now one of the countries favourite sports! Visitors on a Wednesday at noon will see a modern day local lady volunteer getting herself ducked according to ancient custom. 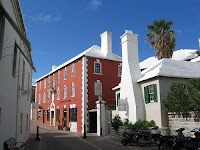 Elsewhere around the town there are a multitude of historical sites such as the old State House (above right), built in 1620 to house Bermuda's Parliament. It is the oldest building on the island and today is rented to the Grand Masonic Lodge of Scotland. A annual ceremony is held full of pomp and circumstance to celebrate the rent payment of one peppercorn to the Bermuda Government. Other buildings worth a gander are The Unfinished Church, the Old Rectory, St. Peter's Church (the oldest Anglican church in the Western hemisphere, photo left), the Tucker House Museum, the Bridge House gallery and Stewart Hall (5 Queen St), nope not the bloke from It's A Knockout but a grand home three centuries old and now a place to buy duty free perfumes. St George hasn't any hotels to note except for a couple of guest houses, although a n ew Park Hyatt is in the works. There are a number of nice restaurants and cafes within the town. Cafe Gio (36 Water St) is great for ice-cream, the Carriage House has great alfresco dining at Somers Wharf and for some hearty fare and live music try the White Horse Tavern in the evening.